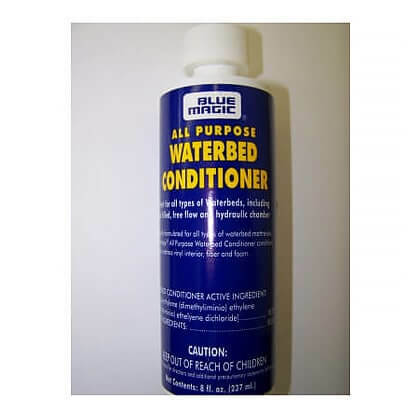 This large bottle of waterbed conditioner will treat the water inside your bed for 10-12 months if you own a fiber filled waterbed bladder or a free flow. Blue Magic is the brand that you can trust to protect your mattress investment. Blue Magic Conditioner is a preventative treatment for your bed. It should not be used alone for a mattress that is already smelling. In that case a waterbed shock treatment should be used and the directions should be followed precisely. While adding waterbed conditioner to your waterbed and burping out the air make sure your safety liner is clean and free of dirt and debris to prevent punctures. Look to make sure your liner does not have tears or holes in it and that it is standing up. A leaky mattress could allow water to escape the waterbed frame. Purchase a New Waterbed Safety Liner Here.